Programmed death 1 (PD-1) is a new member of the CD28/CTLA-4 family, which has been implicated in the maintenance of peripheral tolerance. Two ligands for PD-1, namely, B7-H1 (PD-L1) and B7-DC (PD-L2), have recently been identified as new members of the B7 family but their expression at the protein level remains largely unknown. To characterize the expression of B7-H1 and B7-DC, we newly generated an anti-mouse B7-H1 mAb (MIH6) and an anti-mouse B7-DC mAb (TY25). MIH6 and TY25 immunoprecipitated a single molecule of 43 and 42 kDa from the lysate of B7-H1 and B7-DC transfectants, respectively. Flow cytometric analysis revealed that B7-H1 was broadly expressed on the surface of mouse tumor cell lines while the expression of B7-DC was rather restricted. PD-1 was expressed on anti-CD3-stimulated T cells and anti-IgM plus anti-CD40-stimulated B cells at high levels but was undetectable on activated macrophages or DCs. B7-H1 was constitutively expressed on freshly isolated splenic T cells, B cells, macrophages, and dendritic cells (DCs), and up-regulated on T cells by anti-CD3 stimulation on macrophages by LPS, IFN-γ, GM-CSF, or IL-4, and on DCs by IFN-γ, GM-CSF, or IL-4. In contrast, B7-DC expression was only inducible on macrophages and DCs upon stimulation with IFN-γ, GM-CSF, or IL-4. The inducible expression of PD-1 ligands on both T cells and APCs may suggest new paradigms of PD-1-mediated immune regulation. Programmed death 1 (PD-1)3 is a type I transmembrane protein that was originally identified in a T cell line undergoing programmed cell death (1), but further studies have shown that its expression is associated with lymphocyte activation rather than cell death (2, 3). We previously generated an anti-mouse PD-1 mAb (J43) and demonstrated that PD-1 was expressed on activated T and B cells and a subset of thymocytes (2, 4). Structurally, PD-1 belongs to the CD28/CTLA-4 subfamily of the Ig superfamily and contains a single Ig V-like domain in its extracellular region (5, 6). The PD-1 cytoplasmic region contains two tyrosine residues, with the N-terminal tyrosine being located in an immunoreceptor tyrosine-based inhibitory motif and the C-terminal tyrosine being located in an immunoreceptor tyrosine-based switch motif (ITSM) (7). In vivo studies using PD-1-deficient mice have shown that PD-1 plays an important role in the regulation of peripheral tolerance and prevention of autoimmunity. PD-1-deficient C57BL/6 mice developed a lupus-like disease and arthritis (8). In addition, PD-1-deficient BALB/c mice developed autoantibody-mediated dilated cardiomyopathy (9). Moreover, PD-1-deficient mice crossed with H-2Ld-specific TCR transgenic mice on an H-2b/d background exhibited growth retardation, splenomegaly, and lethal graft-vs-host disease (8). All of these results suggested that PD-1 acts as an important negative regulator of autoimmune responses. Recently, two new members of the B7 family, B7-H1 (PD-L1) and B7-DC (PD-L2), have been identified to be the ligands for PD-1 (10, 11, 12, 13). In vitro studies have shown that the engagement of PD-1 by B7-H1 or B7-DC inhibited TCR-mediated T cell proliferation and cytokine production (IFN-γ, IL-10, IL-4, and IL-2) (11, 12). These results indicated that the cross-linking of PD-1 by B7-H1 or B7-DC leads to down-regulation of T cell responses. However, not all studies support the inhibitory role for B7-H1 and B7-DC. Our previous study has shown that resting T cells stimulated with immobilized anti-CD3 and B7-DC-Ig exhibited enhanced proliferation and IFN-γ production (13). Another group has also indicated that when T cells were stimulated with low levels of anti-CD3 and immobilized B7-H1-Ig, proliferation and production of IFN-γ, GM-CSF, and IL-10 were enhanced (10, 14). These results indicated that B7-H1 and B7-DC could costimulate T cell proliferation and cytokine production. The reason for these contradictory results remains unknown. One possible explanation may be the presence of a second receptor for B7-H1 and B7-DC, which delivers a stimulatory signal. Alternatively, since the ITSM in CD150 has been implicated in both positive and negative signaling, the ITSM in PD-1 may also be responsible for positive or negative signaling via PD-1 (7). B7-H1 mRNA was detected in various organs, including the heart, lung, thymus, spleen, kidney, and liver, and was up-regulated by IFN-γ in monocytes and dendritic cells (DCs) (10, 11). B7-DC mRNA was detected in the liver at a high level and in the lung and spleen at lower levels and was preferentially expressed in bone marrow-derived and splenic DCs but not in macrophages (12, 13). These results suggested the expression of B7-H1 and B7-DC in DCs, which are critical APCs regulating T cell activation and tolerance. However, the cell surface expression of B7-H1 and B7-DC on various APC populations and its regulation remain largely unknown. In this study, we newly generated mAbs against murine B7-H1 and B7-DC and determined the expression of PD-1 receptor and ligands on T cells, B cells, macrophages, and DCs. Six-week-old male C57BL/6 and BALB/c mice and 6-wk-old female SD rats were purchased from Charles River Breeding Laboratories Japan (Atsugi, Japan). Murine T lymphomas L5178Y, WR19L, EL-4, and BW5147; B lymphomas A20.2J, LK35.2, and 2PK-3; macrophage cell lines J774A.1, RAW264.7, and P388D1; melanoma B16; myeloma P3U1 (P3X63Ag8U.1); and Chinese hamster ovary cell line (CHO) were purchased from American Type Culture Collection (Manassas, VA). The hybridomas producing mAbs against CD8 (3.155) and Thy1.2 (J1j) were also obtained from American Type Culture Collection. The hybridoma producing mAb against CD4 (RL172) was kindly provided by T. Tanaka (Osaka University, Osaka, Japan). T lymphoma MBL-2 and erythroleukemia FBL-3 were provided by T. Nishimura (Hokkaido University, Sapporo, Japan). A normal rat kidney cell line NRK-52E was kindly provided by T. Otsuka (Institute of Cytosignal Research, Tokyo, Japan). B lymphoma BAL17, renal carcinoma Renca, fibrosarcoma Meth A, and neuroblastoma C1300 were obtained from the Japanese Collection of Research Bioresources (Osaka, Japan). These cells were cultured in RPMI 1640 medium containing 10% FCS, 10 mM HEPES, 2 mM l-glutamine, 0.1 mg/ml penicillin and streptomycin, and 50 μM 2-ME. CHO cells were cultured in α-MEM medium containing 10% FCS, 10 mM HEPES, 2 mM l-glutamine, and 0.1 mg/ml penicillin, and streptomycin. Purified anti-CD16/32 (2.4G2) and CD3 (145-2C11) mAbs, FITC-conjugated anti-CD4 (RM4-4), CD45R/B220 (RA3-6B2), and CD11c (HL3) mAbs, PE-conjugated anti-CD62L (MEL-14) mAb, allophycocyanin-conjugated anti-CD8α (7) mAb, biotin-conjugated anti-OX40 (OX86), CD69 (H1.2F3), CD54 (3E2) mAbs, rat IgG isotype control, hamster IgG control, and PE-labeled streptavidin were purchased from BD Biosciences (San Jose, CA). FITC-conjugated F4/80 was purchased from Caltag Laboratories (Burlingame, CA). Anti-CD40 (HM40-3) and PD-1 (J43) mAbs were prepared as described previously (2, 15). Anti-CD28 (PV-1) mAb was kindly provided by R. Abe (Science University of Tokyo, Chiba, Japan). Goat anti-mouse IgM F(ab′)2 Ab was purchased from Jackson ImmunoResearch Laboratories (West Grove, PA). LPS was purchased from Sigma-Aldrich (St. Louis, MO). Recombinant mouse GM-CSF, IL-4, IL-12, and IFN-γ were purchased from BD Biosciences. A cDNA fragment encoding the entire open reading frame of mouse B7-H1 was prepared by RT-PCR from BALB/c peritoneal macrophages. A 5′-CCGCTCGAGCCCAAAACATGAGGATATTTG-3′ corresponding to nt 9–28 of murine B7-H1 cDNA (11) tagged with an XhoI site and 5′-ATAAGAATGCGGCCGCTTACGTCTCCTCGAATTGTG-3′ corresponding to nt 870–889 tagged with a NotI site were used as 5′ and 3′ primers, respectively. The PCR product was cloned into a pMKITneo vector, kindly provided by K. Maruyama (Tokyo Medical and Dental University, Tokyo, Japan), and transfected into CHO cells with Lipofectin (Invitrogen, Carlsbad, CA) and into L5178Y and NRK by electroporation. After selection by 1 mg/ml geneticin (Sigma-Aldrich), transfectants stably expressing B7-H1 were identified by staining with PD-1-Ig fusion protein consisting of the extracellular portion of mouse PD-1 (aa 124–564) (1) and the Fc portion of human IgG1. Mouse B7-DC cDNA cloned into a pCAGGS expression vector (13) was transfected into CHO cells with Lipofectin and into RAW264.7, L5178Y, and NRK by electroporation. After selection by 8 μg/ml blasticidin (Invitrogen), transfectants stably expressing B7-DC were identified by staining with PD-1-Ig. To prepare anti-mouse B7-H1 and B7-DC mAbs, SD rats were immunized with B7-H1-transfected L5178Y or B7-DC-transfected RAW264.7 cells. Three days after the final immunization, spleen cells or lymph node cells were fused with P3U1 myeloma cells. After hypoxanthine-aminopterin-thymidine selection, a hybridoma (MIH6, rat IgG2a/λ) producing anti-B7-H1 mAb and a hybridoma (TY25, rat IgG2a/κ) producing anti-B7-DC mAb were selected by their strong reactivity to B7-H1-transfected CHO or B7-DC-transfected NRK, but not to parental cells by flow cytometry and then cloned by limiting dilution. Both MIH6 and TY25 were purified from ascites by the caprylic acid and ammonium sulfate precipitation method, and purity was verified by SDS-PAGE analysis. Cells (1 × 107) were lysed in 1 ml of a lysis buffer containing 1% Nonidet P-40, 50 mM HEPES (pH 7.4), 250 mM NaCl, and 2 mM EDTA. Cellular debris and nuclei were removed by centrifugation, and the supernatant was precleared with protein G-Sepharose (Amersham Biosciences, Piscataway, NJ) preincubated with control rat IgG2a for 3 h at 4°C. The cleared lysates were immunoprecipitated with MIH6-preloaded, TY25-preloaded, or control rat IgG2a-preloaded protein G-Sepharose for 1 h at 4°C. The beads were washed three times with the lysis buffer, and bound proteins were eluted with 1% SDS sample buffer, subjected to 10% SDS-PAGE, and then blotted onto polyvinylidene difluoride membrane (Millipore, Bedford, MA). The blotted proteins were detected using biotin-conjugated MIH6, TY25, or rat IgG2a followed by avidin-biotinylated peroxidase complex (Vector Laboratories, Burlingame, CA) and an ECL Western Blotting Detection System (Amersham Biosciences) according to the manufacturer’s instructions. Total RNA was extracted from cell lines (1 × 107) using RNA STAT-60 (Tel-Test, Friendswood, TX). First-strand cDNA was prepared using a SuperScript First-Strand Synthesis System (Invitrogen) from 5 μg of total RNA. cDNA samples were standardized based on the content of β-actin cDNA. Primers for mouse β-actin were 5′-GTGGGCCGCTCTAGGCACCAA-3′ and 5′-CTCTTTGATGTCACGCACGATTTC-3′. Primers for mouse B7-H1 were 5′-ATGAGGATATTTGCTGGCATTAT-3′ and 5′-TTACGTCTCCTCGAATTGTGT-3′. Primers for mouse B7-DC were 5′-ATGCTGCTCCTGCCCTGCCG-3′ and 5′-CTAGATCCTCTTTCTCTGGAT-3′. PCR was performed in a total volume of 20 μl in PCR buffer in the presence of 0.2 mM dNTP, 1 μM of each primer, and 1 U of Taq DNA polymerase (Advanced Biotecnologies, Surrey, U.K.). After 35 cycles of amplification, the PCR products were separated by electrophoresis on a 2% agarose gel and visualized by ethidium bromide staining. CD4+CD62L+ naive T cells were purified from the spleen of C57BL/6 mice by passage through nylon wool columns (Wako Biochemicals, Osaka, Japan) and by using an auto-MACS column with FITC-conjugated anti-CD4, anti-FITC multisort kit, and anti-CD62L-coupled microbeads (Miltenyi Biotec, Bergisch Gladbach, Germany) according to the manufacturer’s instructions. Purified naive CD4 T cells (3 × 106/ml; >95% CD4+CD62L+) were stimulated with immobilized anti-CD3 mAb (5 μg/ml) in the presence or absence of anti-CD28 mAb (3 μg/ml) for 24–96 h. Small resting B cells were purified as previously described (16). Briefly, splenocytes from C57BL/6 mice were treated with a mixture of hybridoma supernatants (anti-Thy-1.2, anti-CD4, and anti-CD8) and Low-Tox rabbit complement (Cedarlane Laboratories, Hornby, Ontario, Canada). After Percoll (Amersham Biosciences) gradient centrifugation, small B cells were collected from the 60/70% interface. Purified B cells (3 × 106/ml; >95% B220+) were stimulated with anti-IgM Ab (5 μg/ml) and/or anti-CD40 mAb (10 μg/ml), or LPS (5 μg/ml) for 24–72 h. Peritoneal macrophages were obtained from C57BL/6 mice that received i.p. 2 ml of 4% thioglycolate (Sigma-Aldrich) 4 days before. Peritoneal exudate cells were harvested by peritoneal lavage with ice-cold PBS and depleted of nonadherent cells after a 1-h culture on a plastic dish, and then stimulated with anti-CD40 mAb (5 μg/ml), LPS (5 μg/ml), GM-CSF (10 ng/ml), IL-4 (20 ng/ml), or IFN-γ (20 ng/ml) for 24–72 h.
Bone marrow-derived DCs (BMDCs) were prepared by culturing bone marrow cells (5 × 105/ml) from C57BL/6 mice in the presence of GM-CSF (10 ng/ml) for 4–8 days. Nonadherent cells were removed from the culture and fresh medium containing GM-CSF was fed at days 2, 4, and 6 after the initiation of culture. For isolating splenic DCs, spleens from C57BL/6 mice were digested with 400 U/ml collagenase (Wako Biochemicals) in the presence of 5 mM EDTA and separated into low- and high-density fractions on an Optiprep gradient (Axis-Shield, Oslo, Norway). Low-density cells were incubated with anti-CD11c-coupled magnetic beads and the bound cells were isolated by the auto-MACS column. The purified splenic DCs (2 × 106/ml; >95% CD11c+) were cultured with or without anti-CD40 mAb (5 μg/ml), GM-CSF (10 ng/ml), IL-4 (20 ng/ml), IFN-γ (20 ng/ml), or IL-12 (10 ng/ml) at 37°C for 24–72 h.
Cells (0.5–1 × 106) were first preincubated with unlabeled anti-CD16/32 mAb to avoid nonspecific binding of Abs to FcγR and then incubated with FITC- or allophycocyanin-labeled mAbs or biotinylated mAb. After washing with PBS twice, the cells were incubated with PE-labeled streptavidin for biotinylated mAb. After washing with PBS twice, the stained cells (live-gated on the basis of forward and side scatter profiles and propidium iodide exclusion) were analyzed on a FACSCalibur (BD Biosciences), and data were processed using the CellQuest program (BD Biosciences). To characterize the expression of mouse B7-H1 and B7-DC, we newly generated specific mAbs. The expression vectors containing mouse B7-H1 or B7-DC cDNA were transfected into L5178Y, RAW264.7, NRK-52E, and CHO cells. Cell surface expression of B7-H1 and B7-DC on stable transfectants was verified by staining with PD-1-Ig fusion protein (data not shown). We immunized SD rats with B7-H1/L5178Y or B7-DC/RAW264.7 cells and screened the hybridomas producing mAb that reacted with B7-H1 or B7-DC transfectants but not parental cells. Two mAbs, designated MIH6 and TY25, were selected. As represented in Fig. 1⇓, MIH6 reacted strongly with B7-H1-transfected cells (B7-H1/NRK, B7-H1/CHO, and B7-H1/L5178Y) but not with B7-DC-transfected or parental NRK and CHO cells. Parental and B7-DC-transfected L5178Y cells were also stained with MIH6 weakly, which reflected a low level of endogenous B7-H1 expression in L5178Y cells (see below). TY25 only reacted with B7-DC-transfected cells (B7-DC/NRK, B7-DC/CHO, and B7-DC/L5178Y) but not with B7-H1-transfected cells or parental cells. Reactivity of anti-mouse B7-H1 (MIH6) and B7-DC (TY25) mAbs to mouse B7-H1 and B7-DC transfectants. NRK-52E-, CHO-, and L5178Y-derived B7-H1 transfectants (B7-H1/NRK, B7-H1/CHO, and B7-H1/L5178Y), B7-DC transfectants (B7-DC/NRK, B7-DC/CHO, and B7-DC/L5178Y), and parental cells were stained with biotinylated MIH6, TY25, or control rat IgG2a followed by PE-labeled streptavidin. The open histograms indicate staining with the indicated mAb and the shaded histograms indicate background staining with control rat IgG2a. 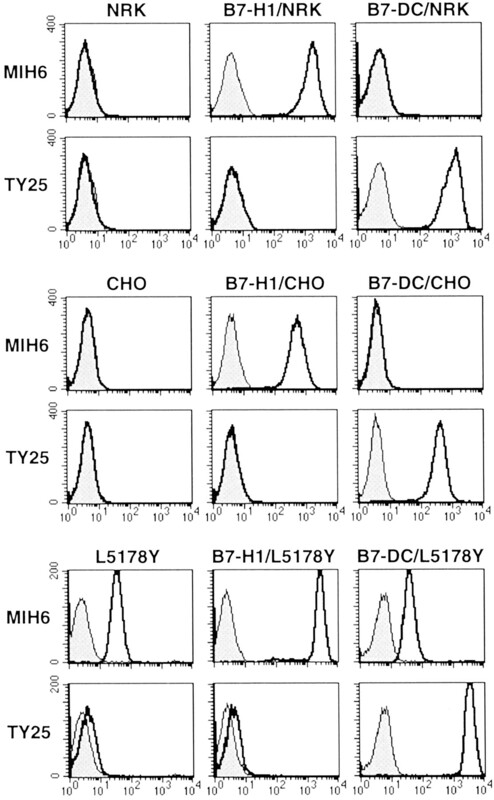 To characterize the Ags recognized by these mAbs, cell lysates of B7-H1/L5178Y, B7-DC/L5178Y, and L5178Y cells were immunoprecipitated with MIH6 or TY25. Then the precipitates were analyzed by SDS-PAGE under nonreducing condition and immunoblotting with biotin-conjugated MIH6 or TY25. As shown in Fig. 2⇓, MIH6 precipitated a 43-kDa protein from B7-H1/L5178Y cells and TY25 precipitated a 42-kDa protein from B7-DC/L178Y cells. The 43-kDa band was also detected in the MIH6 precipitates from L5178Y and B7-DC/L5178Y cells after a longer exposure, which appeared to represent endogenously expressed B7-H1 in L5178Y cells (data not shown). Immunoprecipitation of B7-H1 and B7-DC Ags with MIH6 and TY25 mAbs. Immunoprecipitates with control rat IgG2a, MIH6, or TY25 from L5178Y, B7-H1/L5178Y, and B7-DC/L5178Y cell lysates were subjected to SDS-PAGE under nonreducing conditions, blotted onto polyvinylidene difluoride membrane, and then detected with biotinylated control rat IgG2a, MIH6, or TY25, respectively, followed by the avidin-biotinylated peroxidase complex and ECL. The positions of molecular mass markers are indicated at the left in kilodaltons. We first examined the correlation between the B7-H1 and B7-DC mRNA expression and the MIH6 and TY25 reactivity in mouse tumor cell lines. As shown in Fig. 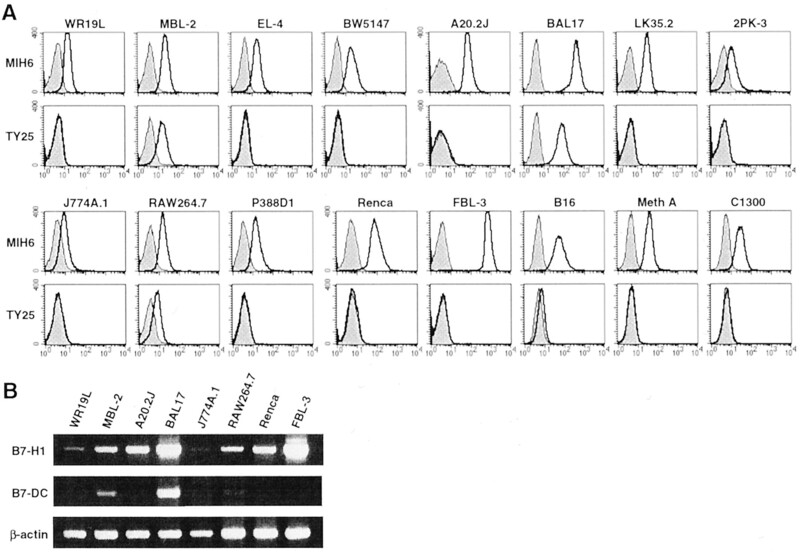 3⇓A, MIH6 reacted with all tested cell lines which expressed B7-H1 mRNA as estimated by RT-PCR (Fig. 3⇓B). TY25 reacted with MBL-2, BAL17, and RAW264.7 cells which expressed B7-DC mRNA, but not with the other cell lines which did not express B7-DC mRNA (Fig. 3⇓). The strict correlation between the B7-H1 and B7-DC mRNA expression and the MIH6 and TY25 reactivity further substantiated their specificity for B7-H1 and B7-DC. Expression of B7-H1 and B7-DC by mouse tumor cell lines. A, Reactivity of MIH6 and TY25 with tumor cell lines. T lymphoma cell lines (WR19L, MBL-2, EL-4, and BW5147), B lymphoma cell lines (A20.2J, BAL17, LK35.2, and 2PK-3), macrophage cell lines (J774A.1, RAW264.7, and P388D1), renal carcinoma cell line Renca, erythroleukemia cell line FBL-3, melanoma cell line B16, fibrosarcoma cell line Meth A, and neuroblastoma cell line C1300 were stained with biotinylated control rat IgG2a, MIH6, or TY25, followed by PE-labeled streptavidin. 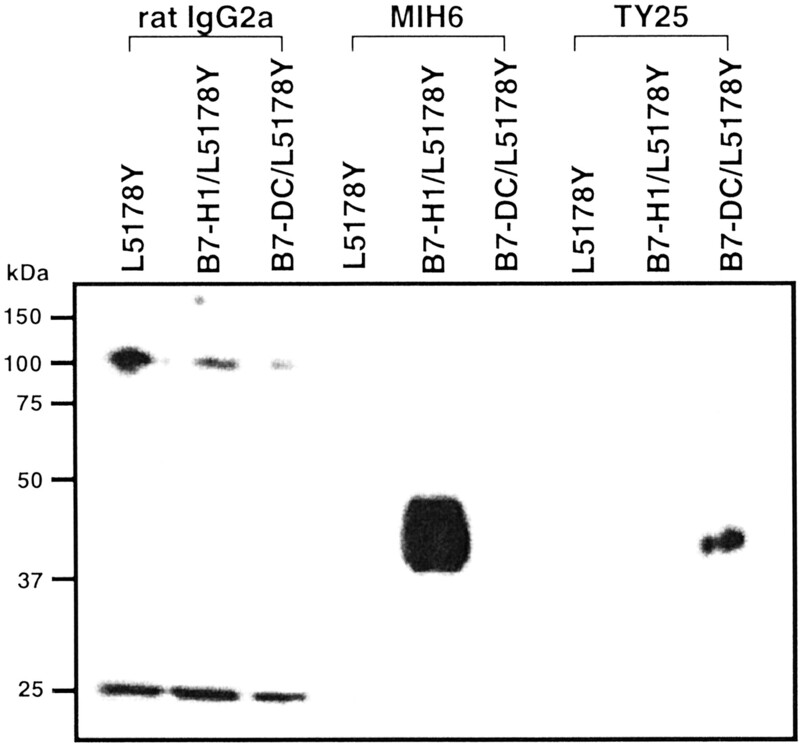 The open histograms indicate staining with MIH6 or TY25 and the shaded histograms indicate background staining with control rat IgG2a. B, Expression of B7-H1 and B7-DC mRNAs in tumor cell lines. B7-H1 and B7-DC mRNAs were detected by specific RT-PCR amplification of total RNA prepared from the indicated tumor cell lines. Amplification of β-actin mRNA was used as a control. We next examined the expression of B7-H1, B7-DC, and PD-1 on splenic T cells by flow cytometric analysis using MIH6, TY25, and an anti-mouse PD-1 mAb (J43) we previously generated (2). An anti-OX40 mAb was also included as an activation marker. Purified naive CD4+ T cells were stimulated with immobilized anti-CD3 mAb in the presence or absence of soluble anti-CD28 mAb for 24–96 h. As shown in Fig. 4⇓A, PD-1 expression was detected on CD4+ T cells after stimulation with anti-CD3 mAb alone, which appeared at 24 h and reached a peak at 48 h. Unexpectedly, naive CD4+ T cells constitutively expressed B7-H1, which was markedly up-regulated by stimulation with anti-CD3 mAb alone (Fig. 4⇓A). In contrast, B7-DC expression was not found on freshly isolated naive CD4+ T cells, but was marginally detectable after stimulation with anti-CD3 mAb for 72–96 h (Fig. 4⇓A). Although the addition of anti-CD28 mAb slightly increased the expression of both B7-H1 and B7-DC on anti-CD3-stimulated T cells, it accelerated the reduction of PD-1 expression at 72–96 h (Fig. 4⇓B). Similar patterns of B7-H1, B7-DC, and PD-1 expression were observed when naive CD8+ T cells were stimulated with anti-CD3 mAb in the presence or absence of anti-CD28 mAb (data not shown). 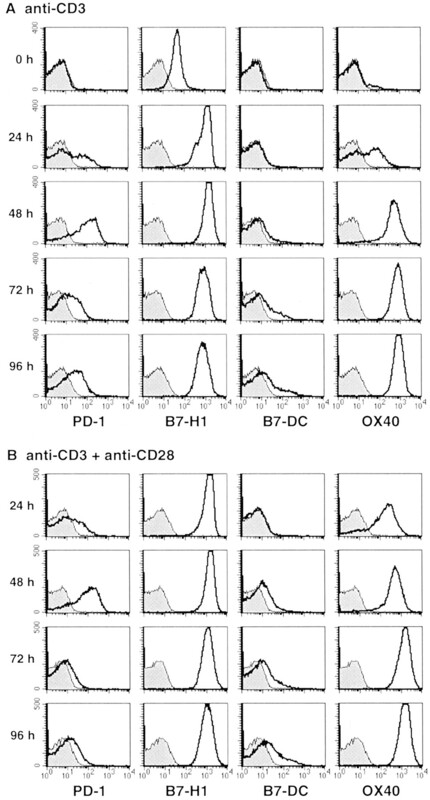 Expression of B7-H1, B7-DC, and PD-1 on CD4+ T cells. Purified splenic naive CD4+ T cells were stimulated by immobilized anti-CD3 mAb with (A) or without (B) soluble anti-CD28 mAb and harvested at the indicated periods. Cells were stained with biotinylated anti-B7-H1 mAb (MIH6), anti-B7-DC mAb (TY25), anti-PD-1 mAb, anti-OX40 mAb, or control IgG followed by PE-labeled streptavidin. The open histograms indicate staining with the indicated mAb and the shaded histograms indicate background staining with control IgG. We next examined the expression of B7-H1, B7-DC, and PD-1 on splenic B cells. Small resting B cells were stimulated with anti-IgM Ab, anti-CD40 mAb, both anti-IgM Ab and anti-CD40 mAb, or LPS for 24–72 h and stained with MIH6, TY25, or J43. An anti-CD69 mAb was also included as an activation marker. Expression of PD-1 was found on anti-IgM- or LPS-stimulated B cells, which was apparent at 48 or 72 h, respectively (Fig. 5⇓, A and D). 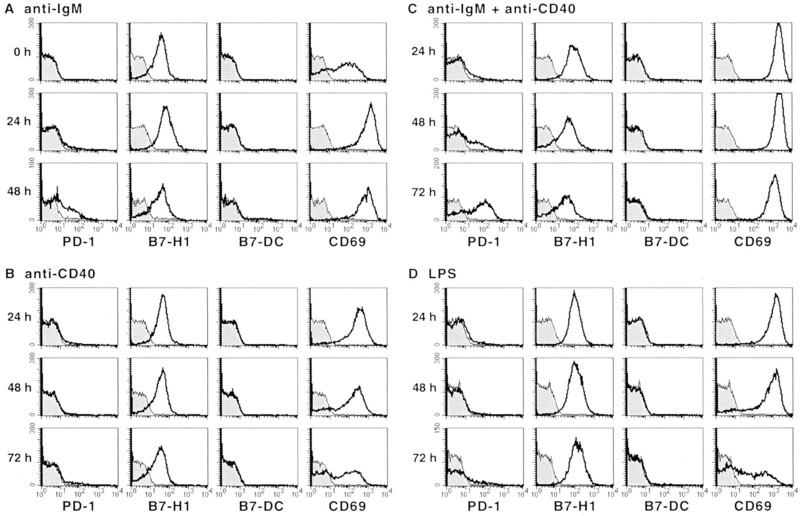 The combination of anti-IgM Ab and anti-CD40 mAb markedly induced the PD-1 expression (Fig. 5⇓C), whereas the stimulation with anti-CD40 mAb alone was not effective (Fig. 5⇓B). B7-H1 was found on freshly isolated B cells at a substantial level and was slightly up-regulated by stimulation with anti-IgM Ab (Fig. 5⇓A) or LPS (Fig. 5⇓D) but not with anti-CD40 mAb (Fig. 5⇓, B and C). In contrast, B7-DC was not found on splenic B cells after any stimulation. Expression of B7-H1, B7-DC, and PD-1 on B cells. Purified splenic B cells were stimulated with anti-IgM Ab (A), anti-CD40 mAb (B), anti-IgM Ab plus anti-CD40 mAb (C), or LPS (D). Cells were harvested at the indicated periods and stained with biotinylated anti-B7-H1 mAb (MIH6), anti-B7-DC mAb (TY25), anti-PD-1 mAb, anti-CD69 mAb, or control IgG followed by PE-labeled streptavidin. The open histograms indicate staining with the indicated mAb and the shaded histograms indicate background staining with control IgG. We also examined the expression of B7-H1, B7-DC, and PD-1 on thioglycolate-elicited peritoneal macrophages. Purified macrophages were stimulated with anti-CD40 mAb, LPS, or cytokines (GM-CSF, IL-4, or IFN-γ) for 24–72 h. Expression of CD54 was also monitored as an activation maker. As shown in Fig. 6⇓A, a substantial level of B7-H1 expression was found on freshly isolated macrophages, which was increased by 24–48 h culture in medium alone and further up-regulated by stimulation with LPS, GM-CSF, IL-4, or IFN-γ (Fig. 6⇓, C--F). Although B7-DC expression was not found on freshly isolated macrophages (Fig. 6⇓A), it was induced by stimulation with GM-CSF, IFN-γ, and especially IL-4 (Fig. 6⇓, D–F). In contrast, PD-1 expression was not found on macrophages after any stimulation (Fig. 6⇓). Expression of B7-H1, B7-DC, and PD-1 on macrophages. Purified peritoneal macrophages were cultured with medium alone (A) or stimulated with anti-CD40 mAb (B), LPS (C), GM-CSF (D), IL-4 (E), or IFN-γ (F). Cells were harvested at the indicated periods and stained with PE-labeled anti-B7-H1 mAb (MIH6), anti-B7-DC mAb (TY25), or anti-PD-1 mAb, FITC-labeled anti-CD54 mAb, or control IgG. The open histograms indicate staining with the indicated mAb and the shaded histograms indicate background staining with control IgG. We previously observed that B7-DC mRNA was preferentially expressed in BMDCs (13). We now examined the cell surface expression of B7-H1 and B7-DC on BMDCs, which were prepared by culturing bone marrow cells with GM-CSF for 4, 6, and 8 days by staining with MIH6 and TY25 mAbs. As shown in Fig. 7⇓, both B7-H1 and B7-DC were found on CD11c+ BMDCs from days 4 to 8 of the culture. Expression of B7-H1 and B7-DC on BMDCs. BMDCs were prepared by culturing bone marrow cells in the presence of GM-CSF. BMDCs were harvested at the indicated periods and stained with FITC-labeled anti-CD11c mAb and biotinylated anti-B7-H1 mAb (MIH6), anti-B7-DC mAb (TY25), or control IgG followed by PE-labeled streptavidin. The middle and right panels show staining of the electronically gated CD11c+ R1 population in the left panel. The open histograms indicate staining with the indicated mAb and the shaded histograms indicate background staining with control IgG. To further examine the expression and regulation of B7-H1, B7-DC, and PD-1 on DCs, we purified CD11c+ splenic DCs and stimulated them with anti-CD40 mAb or cytokines (GM-CSF, IL-4, IFN-γ, or IL-12) for 24–48 h. CD69 was also included as an activation marker. As shown in Fig. 8⇓A, while freshly isolated CD11c+CD8− DCs expressed B7-H1 at a higher level than freshly isolated CD11c+CD8+ DCs, both DC populations up-regulated the B7-H1 expression to a similar level after the culture in medium alone for 24 h. The stimulation with anti-CD40 mAb and cytokines (GM-CSF, IL-4, IFN-γ, and IL-12) slightly enhanced the B7-H1 expression (Fig. 8⇓, B–F). In contrast, B7-DC was not found on freshly isolated DCs, but was induced at a low level by culture in medium alone (Fig. 8⇓A). The B7-DC expression was markedly increased by stimulation with GM-CSF, IL-4, and IFN-γ on both CD11c+CD8+ and CD11c+CD8− DCs (Fig. 8⇓, C–E). 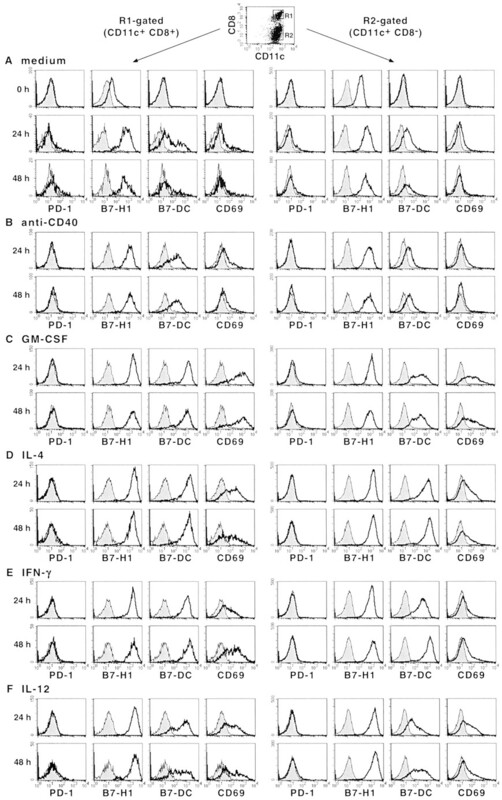 Expression of PD-1 was not found on either CD11c+CD8+ or CD11c+CD8− DCs even after stimulation (Fig. 8⇓). Expression of B7-H1, B7-DC, and PD-1 on splenic DCs. Purified splenic DCs were cultured with medium alone (A) or stimulated with anti-CD40 mAb (B), GM-CSF (C), IL-4 (D), IFN-γ (E), or IL-12 (F) and harvested at the indicated periods. Cells were stained with FITC-labeled anti-CD11c mAb, allophycocyanin-labeled anti-CD8 mAb, and biotinylated anti-B7-H1 mAb (MIH6), anti-B7-DC mAb (TY25), anti-PD-1 mAb, anti-CD69 mAb, or control IgG followed by PE-labeled streptavidin. The left four panels show staining of the electronically gated CD11c+CD8+ R1 population and the right four panels show that of the CD11c+CD8− R2 population. The open histograms indicate staining with the indicated mAb and the shaded histograms indicate background staining with control IgG. In this study, we generated mAbs specific for murine B7-H1 (MIH6) and B7-DC (TY25). The B7-H1 and B7-DC molecules recognized by MIH6 and TY25 exhibited the molecular mass of 43 and 42 kDa, respectively, in SDS-PAGE analysis under nonreducing conditions. Since the molecular mass of the core polypeptides expected from the amino acid sequences of B7-H1 and B7-DC are 32,780, and 27,819, respectively, these results suggested that both B7-H1 and B7-DC molecules are glycosylated and expressed as a monomer. It has been reported that B7-H1 mRNA was broadly expressed whereas B7-DC mRNA was rather restricted in mouse tumor cell lines (12, 13). Consistently, our results demonstrated that cell surface expression of B7-H1 was broadly found on both hemopoietic and nonhemopoietic tumors, but that of B7-DC was restricted to certain leukemias. The engagement of PD-1 by B7-H1 or B7-DC has been reported to inhibit TCR/CD3-mediated T cell proliferation and cytokine production (11, 12, 17). Moreover, Dong et al. (18) recently reported that B7-H1 expressed on tumor cells promoted T cell apoptosis. Therefore, the expression of B7-H1 and B7-DC on tumor cells may represent a novel tumor escape mechanism from immunosurveillance. Using flow cytometric analysis, we formally determined the expression of B7-H1, B7-DC, and PD-1 on murine T cells and APCs including B cells, macrophages, and DCs. Some new findings were obtained as follows. Our previous report demonstrated the PD-1 expression on splenic T cells after anti-CD3, Con A, or PMA plus ionomycin stimulation (2). We now demonstrated that PD-1 could be expressed on naive T cells upon anti-CD3 stimulation alone without anti-CD28 costimulation. More importantly, B7-H1 is constitutively expressed on naive T cells and markedly up-regulated by anti-CD3 stimulation. It has been known that TCR/CD3 stimulation of naive T cells in the absence of CD28 costimulation induces anergy (19). PD-1-B7-H1 interaction may be involved in this process. On splenic B cells, PD-1 expression was induced by anti-IgM or PMA plus ionomycin stimulation (2). We here demonstrated a higher expression of PD-1 by anti-IgM plus anti-CD40 stimulation and no induction by anti-CD40 stimulation alone. This suggests that PD-1 is preferentially expressed on surface Ig-stimulated Ag-specific B cells upon interaction with CD40L-expressing Th cells. PD-1−/− C57BL/6 mice developed lupus-like disease with and increased number of B cells and serum IgG2b, IgG3, and IgA (20). PD-1−/− BALB/c mice developed dilated cardiomyopathy with a high level of IgG1 autoantibodies (9). These studies suggested a critical role for PD-1 as a negative regulator of B cell responses. In this respect, our present finding of PD-1 on activated B cells and B7-H1 on activated T cells is intriguing, since it suggests that the engagement of PD-1 on B cells by B7-H1 on T cells may constitute a novel pathway of T cell-mediated B cell suppression. 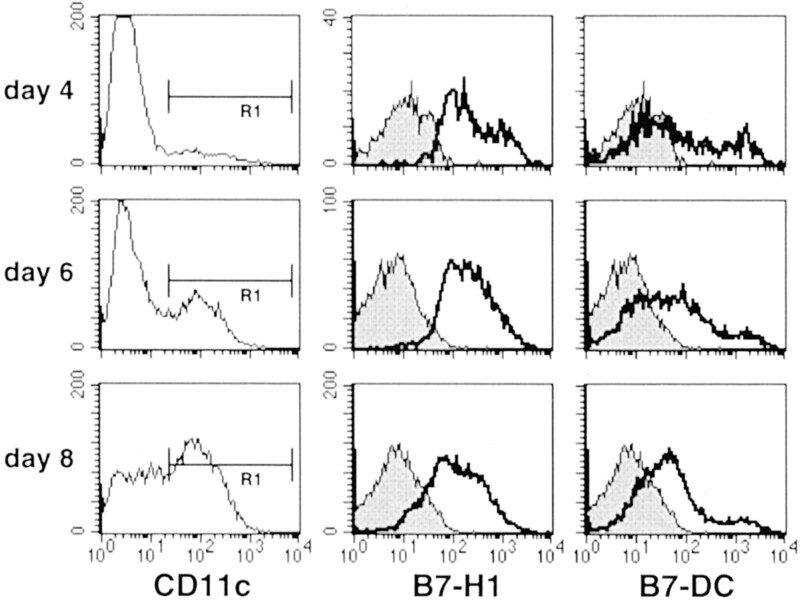 In human monocytes, induction of both B7-H1 and B7-DC mRNAs by IFN-γ stimulation has been reported (11, 12). We now demonstrated that B7-H1 is constitutively expressed on the surface of murine peritoneal macrophages and is up-regulated by LPS, IFN-γ, and IL-4. In addition, B7-DC expression was also induced by GM-CSF, IFN-γ, and IL-4. These results indicated that B7-H1 and B7-DC expression on macrophages can be regulated by both Th1 (IFN-γ and GM-CSF) and Th2 (IL-4) cytokines. Further studies are now under way to explore the costimulatory or suppressive function of B7-H1 and B7-DC on macrophages when they act as APCs for T cells. We previously demonstrated that B7-DC mRNA was preferentially expressed in BMDCs but not in bone marrow-derived macrophages (13). We now verified the cell surface expression of B7-DC, as well as B7-H1, on BMDCs. This B7-DC expression on BMDCs seems to result from GM-CSF stimulation rather than differentiation into DCs, as observed with peritoneal macrophages. 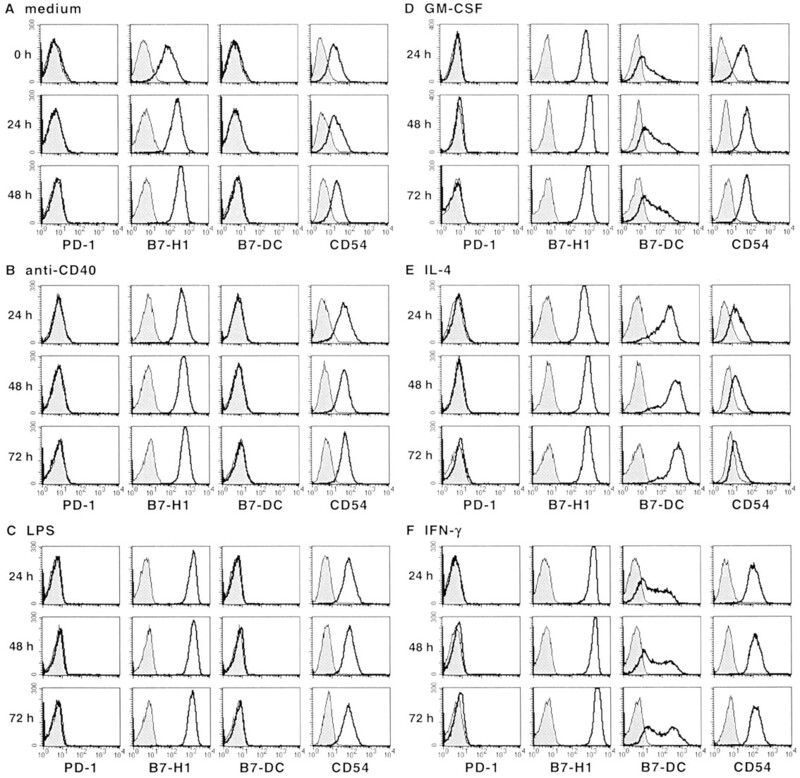 Among freshly isolated splenic DCs, the CD8− myeloid DC population exhibited a higher expression of B7-H1 than the CD8+ lymphoid DC population, mechanisms for which are presently unknown. However, both DC populations rapidly up-regulated B7-H1 expression to a similar level upon in vitro culture, which may be mediated by autocrine GM-CSF. Although we previously showed the expression of B7-DC mRNA in splenic DCs (13), cell surface expression of B7-DC was not found on freshly isolated splenic DCs but was rapidly induced upon in vitro culture, which may be also induced by autocrine GM-CSF. Alternatively, cell surface expression of B7-DC on splenic DCs may be posttranscriptionally modulated in situ. B7-H1 and B7-DC expression on splenic DCs was further up-regulated by both Th1 (IFN-γ and GM-CSF) and Th2 (IL-4) cytokines. This may be relevant to the costimulation or suppression of both Th1 and Th2 responses by these molecules. In summary, we herein characterized the cell surface expression of B7-H1 and B7-DC on murine T cells and APCs including B cells, macrophages, and DCs. Further studies are required to explore the functional roles of B7-H1 and B7-DC on these cells. The regulated expression of these two PD-1 ligands on both T cells and APCs suggest new paradigms of PD-1-mediated immune regulation. We thank R. Abe for mAb and T. Tanaka, T. Nishimura, and T. Ohtsuka for cells. ↵1 This work was supported by grants from the Ministry of Education, Culture, Sports, Science and Technology and the Ministry of Health, Labor and Welfare, Japan. ↵3 Abbreviations used in this paper: PD-1, programmed death 1; ITSM, immunoreceptor tyrosine-based switch motif; DC, dendritic cell; CHO, Chinese hamster ovary; BMDC, bone-marrow derived DC.